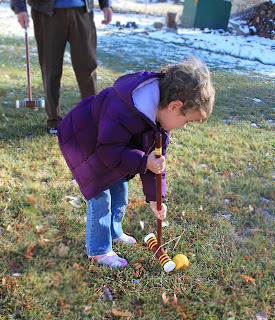 Our kids loved playing crochet croquet when they were younger, so we thought a croquet set would be a perfect gift for Addy's 4th birthday. 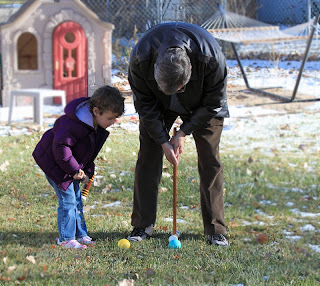 She loves being outdoors and loves playing games; great match, right? The set arrived the day after her birthday. 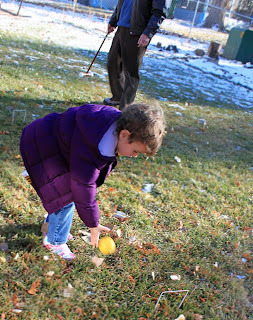 We got it unpacked right away and took it out to the back yard, even though the temps were barely above freezing. 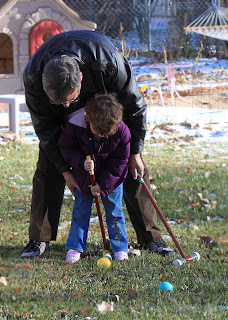 PopPop gave Addy some pointers on technique and then turned her loose with a mallet and ball. And stood waaaaaaay back. 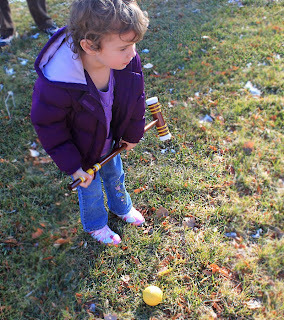 Addy had a great wind-up, but actual contact with the ball was hit-and-miss (mostly miss). 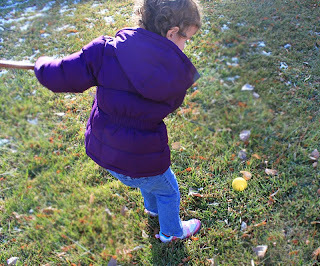 She got frustrated when the ball didn't go very far and quickly figured out a better way to play - pick the ball up and toss it where you want it to go. 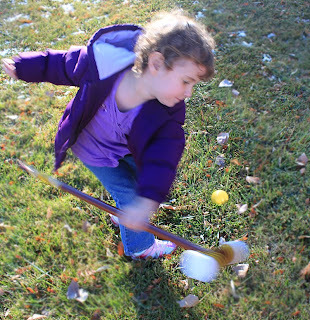 I think Addy will like whack-a-doodle more when summer is here and the grass is cut shorter and the ground isn't so damp. 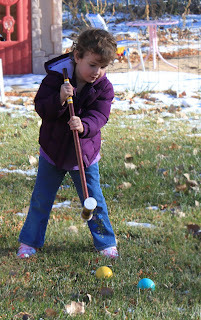 Hope she has as much fun with croquet as we've had over the years. 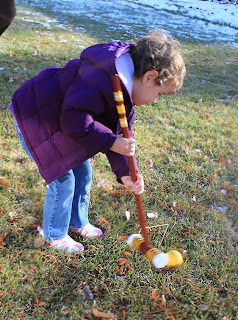 Giggling at your typo: "crochet" vs. "croquet". . .Freudian slip? I noticed it too and it gave me a laugh! I wonder how many times you have typed 'crochet' compared to croquet. Crochet is probably automatic by now. Tee-hee, your pun on crochet/croquet reminds me of the time I ordered a crochet book from my local bookshop and they rang me up to let me know my book on croquet was in! Looks like Addy will enjoy playing with her new toy!